PlayStation Experience has to personally be my favorite event of the year. Don’t get me wrong – I have been going to E3 since 2011 and have loved my time there as well, but for different reasons. A lot of it has to do with meeting up with the rest of the staff and industry people that I’ve interacted with online and in person. It’s being able to attend these amazing press conferences that are excited to be a part of in person. But that week is mostly dedicated to the big dogs in the business. I have been attending PlayStation Experience since its inception back in 2014. At that time in Las Vegas, the venue was very small, taking place inside of two hotel conference halls. Granted, the rooms themselves were fairly large, but after I was done watching the showcase (aka the Sony press conference) and walked into the exhibitor hall next door, I saw firsthand how few companies were actually attending. Clearly, Sony had yet to really prove to their third party friends it was really worth the time and money investing into this weekend affair. Flash forward two years, and I found people who had camped out the night before just to wait in line for when the doors opened. There were far more booths than there were before, and it felt crowded. But most of all, I appreciated with just how many independent developers were there. Dozens of people from different backgrounds with different philosophies and struggles were taking full advantage of the space they had to draw people into their area. Whereas before it felt like you could tell an indie game from a mile away, nowadays there’s so much time and money and effort put into these projects you could hardly tell them apart. With the recent news about how large-scale AAA games are seeing stagnating figures, you see more and more people turn towards these “smaller” experiences to get their money’s worth. And that’s the thing – it feels like in today’s economy and wage gap, people are looking for those less expensive alternatives that have proven time and time again to be just as good if not better than their multi-million dollar budget rivals. It is with that in mind that I wanted to highlight FIVE of the independent games that captured my attention roaming around the halls of PlayStation Experience in the Anaheim Convention Center. We start our list with a game that has been in development for a decade. That seems to be the story lately in the industry. Whether it’s Final Fantasy XV, The Last Guardian, Nioh, Owlboy, or in this case, Heart Forth, Alicia, you have these games that have been in steady development or actually laying dormant for many years finally finding their way towards a proper release. Let no one tell you making games is easy! We ourselves started covering the game back in 2014 when we added it to our “Upcoming RPGs of 2014” list. This was a couple months before it was brought to Kickstarter to help fund its continuing development. I had a chance to spend about 15 minutes playing Heart Forth, Alicia at this year’s PlayStation Experience, and quickly fell in love with both the pixelated look and fun mechanics. I guess I’m a sucker when it comes to 16-bit graphics having grown up with a Super Nintendo (and the NES, but I was only starting to get cognizant at that time). It’s pretty clear games like Heart Forth, Alicia and Owlboy would never work on older systems due to the number of rendering systems and programming work that requires a more capable platform. It may be sort of silly to say that from the outside, but you’d be surprised how challenging it can be to create pixel art and have it look as good as it does in this game. Heart Forth, Alicia bills itself as a “Metroidvania RPG”, drawing plenty of inspiration from Castlevania: Symphony of the Night down to the whip that Alicia carries. It brings that old school challenge with a heavy emphasis on platforming (with tight controls), while also leaning into its RPG mechanics. There’s damage numbers popping off of enemies, a leveling system that affects Alicia’s stats, and a variety of towns to visit. It also has some absolutely gorgeous music backed by soft vocals that really sets the tone of the narrative. Throw in the satisfying gameplay, and you have a remarkable title worthy of people’s attention. Supergiant Games have outdone themselves once again with this one. Whereas Bastion and Transistor had you playing a singular character who spent almost the entire experience being talked at, Pyre creates a whole new precedent for the team – a game where featuring an ensemble cast, each with their own personalities and backgrounds. It’s essentially a multiplayer-based action game featuring a campaign and a versus mode. And it once again goes to show that this developer tries its best to avoid re-treading old ground. The story is about a band of exiles who have been forced into a purgatory of sorts. The only way they can fight their way back to regain their freedom is to trust the Reader, the name bestowed upon the player. As the Reader, you’re able to derive meaning from the words and symbols found in the different texts scattered around the world. With your help, they’ll be able to return home and be absolved of their transgressions, and along the way you’ll get to know them and the people you meet, discovering what’s at stake for them as well. Let me back it up a little. Pyre is a party-based RPG where you will be able to level up your characters and unlock skills they can use in battle. These battle are called the Rites, ritualistic competitions where you control a team of three people facing another team of three people. The goal is to extinguish your opponent’s ceremonial flame by using a Celestial Orb (kind of like a flag or basketball) and carrying it into the flame itself. You can only control one party member at a time, and each have their pros and cons, which basically comes down to representing power, speed, and a balance of the two. You can sprint or leap to get around them. Surrounding each character is aura, and if you touch that aura while it’s appearing, your character will be “banished” and you’ll have to wait a bit before they return. You also have a projectile attack that does the same thing, with the environment creating the only real barrier. In the meantime, unless you have another party member to control, the enemy has free reign to run towards the goal kind of like Capture the Flag in Halo. It’s a lot of fun, and even early on I could tell the battles could get pretty fierce once you had the tactics down. I would like to point out that Supergiant Games had a fairly large booth this time around with several stations set up. I spoke to Greg Kasavin, writer and designer for the company, and he expressed how excited he was being at the show and being able to have such a big presence. It’s their story that I think resonated the most with me and reminded how much I enjoy seeing the success of these small teams. 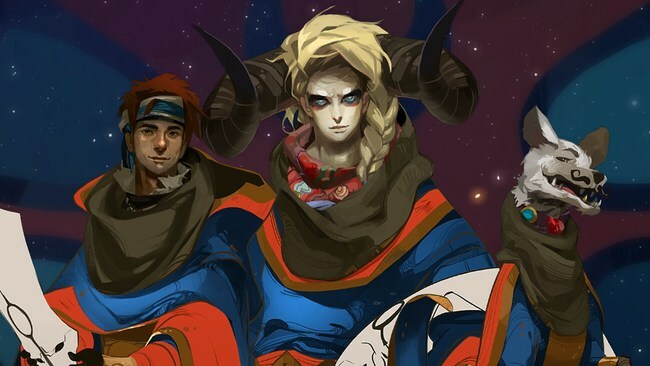 In a way, Pyre is a far more traditional version of storytelling Supergiant has done up until now which focused more on using voiceovers to drive the gameplay. It’s for that very reason, while also being a big fan of Bastion and Transition, that it’s one of my most anticipated games of 2017. I had been following the development of Battle Chef Brigade back when it was originally announced for Kickstarter. It sounded like an interesting enough foundation – take the Iron Chef TV show about two chefs duking it out with one central ingredient being required for all their dishes, and blend it together anime-style visuals and story-driven gameplay. 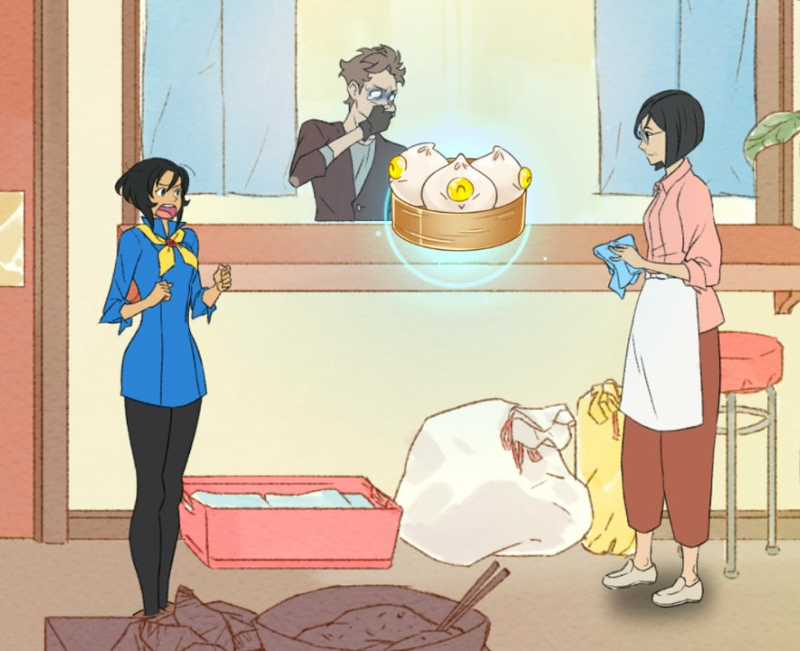 The plot of Battle Chef Brigade is about a girl who aspires to be a great chef, which goes against her parent’s wishes of staying at the family restaurant and inherit it in the future. Being the rebel that she is, she would much rather carve her own path in the world – can’t blame her for that one. Therefore, she enrolls in the local academy and starts to work her way up the ranks. Instead of using the normal livestock we are all accustomed to, she instead has to head out during the competition to fight and kill giant boars, fire-breathing dragons, fairies, and other mutated creatures and cook them into dishes. The game likes to play it up as you’re creating gourmet food and you didn’t just beat the ever-living crap out of a giant fairy and decided to use its guts as the sauce, but we’ll roll with it. The competitions themselves use a point system – the more elaborate you are with your dishes and the way they feature the main ingredient, the higher you score. You start off by choosing a pan or pot, either of which can have these multipliers imbued within that can have an impact on said overall score. Each ingredient is represented by a group of red, green, and blue orbs when they’re placed into a pot or pan, Tetris-style, where you are then allowed to rotate the orbs around while cooking. You’ll have to match three of the same type of orb up to create a single upgraded orb, which in turn can be lined up to create a more powerful version of that colored orb and so on. The quality of your ingredients and the strategy you use to line them plays a key role in the results. Some amazing dishes can be created and then scored by the judge, who also parts some wisdom on growing as a chef. While things start off simple enough, it’s got this amazing complexity to it that will certainly continue to grow as the game goes on. As someone who used to watch A TON of Iron Chef, even using a bunch of blank VHS tapes to record the episodes during the marathons they would have on TV, I was already sold on the concept. The developers have done an amazing job creating a game filled with entertaining action and very likeable characters. Having tried it at PSX, I am that much more excited to play the full version when it launches next year. 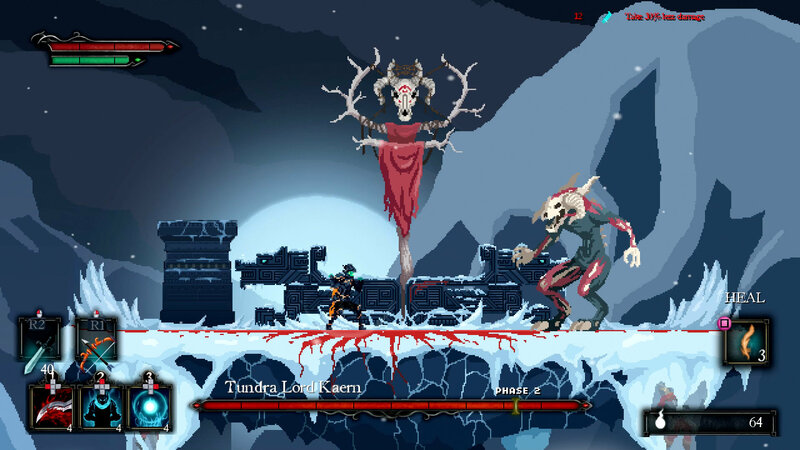 Death’s Gambit is a game that I feel we as a site have been covering forever. But really, I first spotted it on an indie news site (apologies for not remembering which one) which had posted this breathtaking GIF of a person on horseback riding through a snowy trail as a titan of a creature stomped around in the background. It was incredibly majestic in how smooth the animation looked and how bright a color palette it was using, and not too dissimilar to my favorite game of all time: Shadow of the Colossus. Last year, the game was announced for the PlayStation 4. I did spot it a couple shows since then, including last year’s PlayStation Experience. I was in so much love with it that I tried to share it with as many people as I could. I actively wanted people to pay attention to this game, and enjoyed seeing the positive response it received from both our Twitter followers and especially the people who were playing it. Due to my schedule, I never really got a chance to go hands-on with the game until this past weekend at PSX 2016. It’s clear almost immediately how much the game draws from its inspirations – Castlevania and Dark Souls. 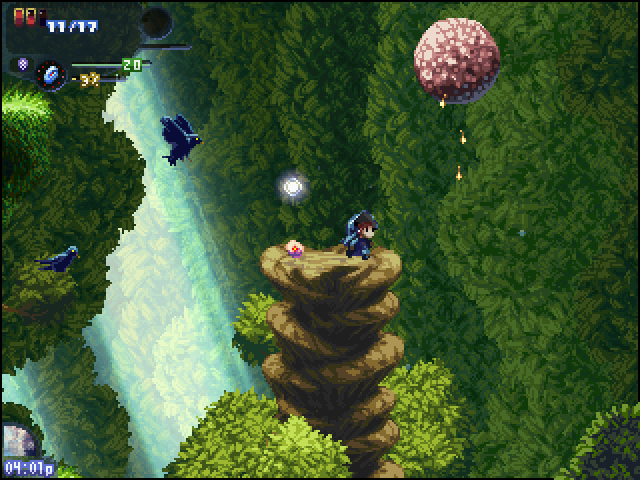 The pixel art looks even better from up close, and it can’t be understated how beautiful everything looks in motion. The boss battle featured in the demo was as unforgiving as I expected it to be, but when I finally defeated my giant adversary, I felt that same sense of accomplishment that people who play the Soulsborne series completely savor. I highly recommend keeping a very close eye on this one as it (finally) nears a release. A couple years ago I finally decided to play a little game for the Sega CD called Snatcher. It’s this amazing adventure game designed by Hideo Kojima that he worked on before Metal Gear Solid. What I loved most was how it blended together a cyberpunk setting with film noir storytelling. To this day there are very few games that have attempted and be successful in this game design. Really, the only other game that came close was Policenauts, another one of Kojima’s games that was just as good if not better than Snatcher. 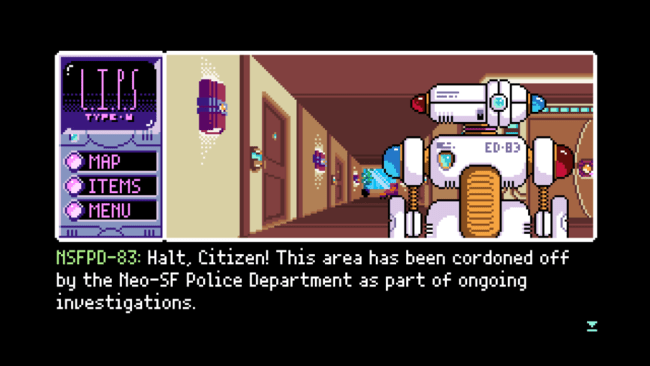 That’s what has me so excited about 2064: Read Only Memories. It is exactly the type of game I have been looking for, and it clearly takes after the graphic novel games from the PC-98 and Sega CD era. Okay, so the game is already been out on PC and Ouya (I felt the need to mention the latter one). But its upcoming release on the PlayStation 4 and Vita is a far more ambitious endeavor than the previous versions. For one, developer MidBoss has added voice acting to the game, which includes some recognizable people including journalist Jim Sterling and WWE superstar Xavier Woods. They have also made enhancements to the story and the puzzles featured in the game. This update will be coming to PC and Linux owners as a free download sometime early next year. 2064: ROM is finally nearing its console debut sometime soon. One of the people at the booth talked about how they were dealing with technical issues with the Vita, citing memory limitations that has also plagued other developers from taking advantage of the handheld. This has resulted in the indefinite delay of its release on that platform. Thankfully, the PlayStation 4 version should be out sometime in January, and if what I played at PSX was any indication, it will be an great time for fans of point-and-click adventure games. And while I don’t really consider it indie, Ys Origin was also a huge surprise – not because it’s a port of an old game (as Bryan likes to point out =P), but because it was the first time in the west I can remember Nihon Falcom actually having a presence on stage at a press conference outside of some sizzle reel. You can bet when I heard “Scars of the Divine Wing” start playing, I lost my mind and started yelling at the stage in excitement! I am a huge fan of that game, and can’t wait to play more of it on my PS4 and especially my Vita when it gets localized next February. DotEmu are really good at what they do, so I trust them to create a worthwhile experience for us. I do want to give some special mentions to a few other games we don’t typically cover here that I still had a lot of fun playing. Just Shapes & Beats is a fantastic rhythm-based shooter where the action is literally on cue with the music. You can’t help but bounce your head to the great soundtrack. Garou: Mark of the Wolves is one of those games I played a lot of with friends in school (even if I was never good at it), and is easily one of the best fighting games of all time. Very glad that’s already out, even if I still need to find time to play it! Windjammers, a really fun arcade frisbee game (basically) was one of those out-of-nowhere announcements that I think a lot of people on the internet aware of thanks to the folks over at Giant Bomb who helped spread the word on its amazing gameplay that eventually led to its big announcement. So that’s some of the dozens of independent games that lured me in during my trip to PlayStation Experience 2016. I can’t wait to attend next year’s event and see how much further it has grown. It already feels like it will soon be competing with the likes of PAX just by its sheer scale and Sony’s commitment to creating the ultimate fan event. I am naturally interested in PlayStation due to the amount of RPGs on their platforms, but I would love to see Nintendo and Microsoft hold similar events in the future in light of Sony’s success. In the meantime, I’ll be staying on the lookout to share with you even more fantastic games! This entry was posted in Articles and tagged 2064 read only memories, alicia, battle chef brigade, death's gambit, heart forth, indie, playstation, playstation 4, ps4, psx, pyre, rom, sony, steam, vita. Bookmark the permalink.